In developing our style guide and visual identity in 2018, Community Legal Centres NSW drew inspiration from Anthony Walker's artwork: Seven Sister Increase Song Cycle. 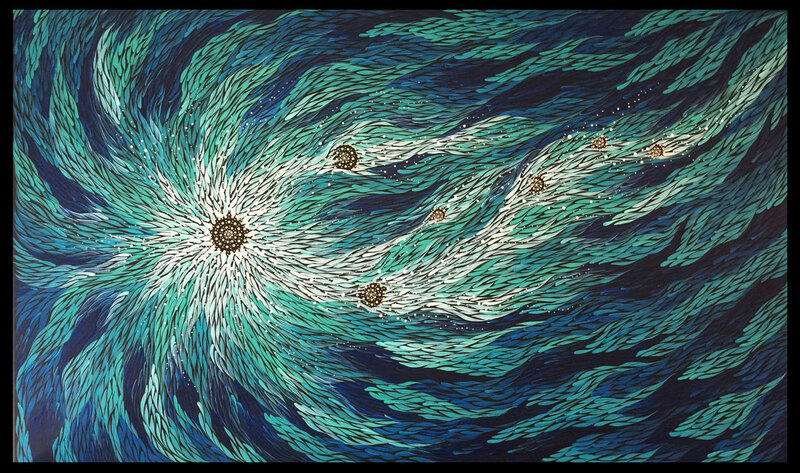 Anthony's language group is Yiman/Gurreng Gurreng and he describes the work as depicting "the Seven Sister Star Constellation (the Pleiades) being sung up by men from my grandfather's language group - Yiman." Community Legal Centres NSW purchased a licence to use the artwork from Anthony in the process of developing our 2018-2020 Reconciliation Action Plan. We then used the shapes, moods and colours to inspire the visual elements we often use in communicating publicly - an acknowledgement that reconciliation is a process of transformation. Community Legal Centres NSW works in partnership with Aboriginal organisations, including community legal centres that are Aboriginal organisations. As a sector we work towards reconciliation, recognition, truth and justice with and for Aboriginal and Torres Strait Islander people.